In the current issue of TIME there’s a huge cover story by Steve Brill. It’s 24,000 words, and do you know what he concludes? He concludes that health care is very expensive, the prices are very high, and hospitals charge those high prices for the same reason that any other business would. It’s because they can, and Brill concludes in 24,000 words that Obamacare is not only gonna not help, it’s gonna make it worse. Now the latest number is that Obamacare is going to add $6.2 trillion to the national debt. But the point of the Matt Iglesias story is: “We pay our doctors way too much.” Do you remember, it wasn’t long ago, I warned you to be on the lookout for this from somebody on the left? I predicted it wasn’t gonna take much time. “Somebody on the left is going to say, ‘Why should there be profit in health care? Why should doctors get rich simply for making sick people well? “‘Why should that cost anybody anything? But especially, why should there be so much profit in treating the sick? Why should there be anybody making loads and loads of money, obscene profits, simply by treating the sick and making them well? '” And, lo and behold, here it is! It’s in TIME Magazine. Slate: “We Pay Our Doctors Way Too Much.” This is an adjunct story to the Steve Brill cover story, the long investigation the American health care system. They looked at prices. This Iglesias story, as I say, is an adjunct because he believes that Brill missed something in his 24,000-word analysis. Iglesias says (paraphrased), “You know, we’re paying our doctors too much. We could really cut costs. We could make health care much less expensive if we just rolled back what we’re paying doctors,” and he gets into it just exactly as I knew they would. Leftists are predictable, folks. Liberals, I know these people. It’s all about morality, fairness, justice, a fair shake, a balanced approach. “It’s just wrong — it’s just obscene — that any one person should become a multimillionaire simply for treating the sick. That ought to be something somebody would do for nothing. That ought to be something that’s purely humanitarian, but certainly it shouldn’t include massive profit. There is something institutionally wrong with that,” and, by the way, that’s gonna sell. I just want to warn all of you doctors: Now that this thing has got its official imprimatur in TIME magazine, this is gonna take off. If you think the low-information voters are not gonna lap this up, I have another thing to tell you and another bridge to sell you. This is gonna take off like wildfire. You’re going to have people going, “Yeah, that’s right! That’s exactly right. Doctors are the reason that health care is so expensive,” and they’re gonna focus on the kind of cars you doctors drive, and they’re gonna focus on your houses and where you live, and they’re gonna focus on the country club memberships that you have. And then, “Why should there be any profit at all in medicine? It’s nobody’s fault that they got sick!” That will be the case in this scenario. Now, normally it is your fault if you get sick, because you ate the wrong thing, you behaved the wrong way, you inhaled the wrong thing, you drive the wrong kind of car, whatever. Normally your getting sick is your responsibility but now, for this instance, it won’t be. You’re gonna be the essence of innocence. Remember, it was Pennsylvania senator Harris Wofford who made the contention that since Constitution guarantees you a lawyer, then the Constitution ought to guarantee you health care. (summarized) “If we will pay for your lawyer when you can’t afford one when you’re accused of a crime, why don’t we pay for your health care?” and it took off. So another prediction here — one about the NFL and now medicine — coming to fruition in a much shorter period of time than I actually thought it would take. 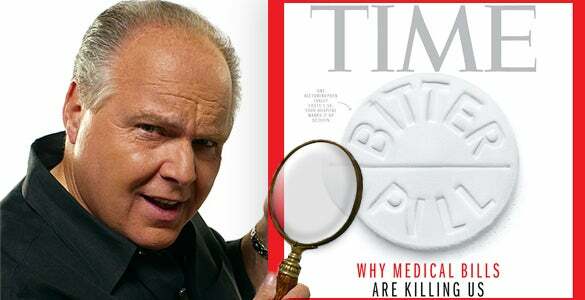 RUSH: Matt Iglesias in TIME Magazine. Remember now, Steve Brill did a 24,000-word assessment of American health care and Obamacare, and he concluded that it’s too expensive. And, by the way, he’s right about something. It’s expensive because somebody pays for it. But it’s not the patient. Well, ultimately it is, but the patient doesn’t know it. There is no direct relationship between the consumer and the provider in health care. And if there were, you would see prices come down faster than anything else. It’s amazing. You go into the free market, you buy a car. You deal with the dealer. You deal with the salesman. The price is on the sticker. You negotiate, get the best price you can. You walk out of there and you lie to people about what a great deal you got. With health care, you don’t do any of that. You have an insurance plan. You might have a copay. Whatever they charge, somebody’s paying. You may be paying a big percentage of it, but it’s out of your hands. B ut if you had to pay for every dime of health care you get, you’d be far more interested in how much it costs, and you would be a more discerning and discreet shopper and there would be competition. And that doesn’t exist. With Obamacare it’s only gonna get worse, and Brill says that. So, anyway, it’s a 24,000-word analysis of American health care in which Brill concludes it’s too expensive. Right, we need 24,000 words for that. But another reporter at TIME magazine says, wait a minute, Brill missed something. Twenty-four thousand words is almost the whole magazine these days, given how small it is. Twenty-four thousand words and he missed something, and Iglesias said what he missed was the doctors are making too much money. So Iglesias, the author of this piece in TIME magazine, says that we need Congress to mandate lower prices. We need Congress to mandate lower payments to doctors. Let me read from this article. “When foreigners force prices to be lower, they get lower prices.” Really? The National Health Service in Great Britain, really, prices are down because people want them to be? It’s absurd. “When Americans force prices to be lower (via Medicare), we get lower prices. If we want lower prices through new legislation, the way to get them is to write laws mandating that the prices be lowered.” Oh, well, why didn’t I think of that? Why don’t we have somebody in Congress write a law that gasoline prices are too expensive? And then why don’t we have a law saying that houses are too expensive, and let’s have Congress write a law that says property, land, is too expensive. And next, let’s have somebody in Congress write a law that college is too expensive, tuition prices are going through the roof, we need Congress to mandate lower prices. Now, the low-information voters in the audience are cheering right now when they hear me say this. I am sitting here, you and I are well aware I’m making fun of this proposition. Everybody knows that that’s not how you make prices lower. You cannot artificially — well, you can, you can do it, but you’re gonna blow up the whole system. It does not work. Wage and price controls have never worked, folks. You know what the best illustration is, and it still happens in countries where they freeze wages and prices. The first time I was alive and this happened, 1972, ’73 I remember I lived in Pittsburgh. I was working for a radio station that was owned by ABC. I was very proud of that. ABC was big back then. Nixon announced wage and price controls, just froze everything, and management at the station loved it. “Oh, we would love to give you a raise but, nah, the government’s frozen, we can’t do it,” and they of course didn’t look for creative ways for us. They did for themselves. They invented bonuses, stock options, all kinds of new compensation that were not covered by the freeze. And then I noticed I’d go to the grocery store, and prices still went up. I’d say, “Wait, how does this happen? I thought there was a freeze. There’s a freeze on my wages.” I asked an economist about this one day later on, how’d this happen. He said, “Well, it’s very simple. For example, in the butcher department the grocery store, all they did was invent a new cut, maybe the Delmonico B that never existed, and there were no price controls on the Delmonico B. So they stopped selling Delmonico cut because the price is frozen. They create this new Delmonico B, which might just be an ounce bigger, and they can charge whatever they want for it.” The point is the creative are always going to find ways around artificially mandated prices. But this is one of these things that low-information voters are never, ever gonna learn. All they’re gonna do, if they hear about it — it’s a roll of the dice even on that — but if they do hear that this guy, ’cause I don’t think the low-information crowds are reading TIME magazine. But if one of them happens to stumble across it in the doctor’s office, which is where a lot of low-information people hang out, that and the bowling alley, if they happen to run in to a copy of TIME magazine, if they happen to open it and read the words, not just look at the pictures, and they stumble across this idea that Congress could just make health care more affordable by mandating lower prices, they’d start cheering it. Well, they already think the government does everything else. Why doesn’t the government fix prices? Why doesn’t the government make things cheaper? They’re doing everything else. And they would cheer it. And that, ladies and gentlemen, is what we’re up against. And that’s why I’m warning you doctors, don’t sit out there and think this is never gonna happen. The ball is rolling now. We’ve got a president who thinks the health care system’s broken precisely because there are too many people in it getting rich in an immoral and unjust way. We have a whole bunch of leftists who believe there ought not be profit in anything, anything, but especially health care, because that’s a humanitarian pursuit. Leftists really think that a drugstore owner, grocery store, whatever, should sell everything at cost, make no profit, so that everybody can afford things. They think that would be fair. Why should there be profit you? If you explain to them: What would the man who owns the store live on if he charges only what it costs him to buy the products on his shelves? He’s gotta pay his taxes. He’s not gonna be able to afford to keep the store open. He won’t be able to buy his own food. “Well, let him go get food stamps, then, like I do,” would be the reaction. “Why should there be profit in food? We all need food. We can’t live without food, why should there be profit in it?” That’s where we’re headed, folks. And we’ve got a regime that’s promoting and rewarding that kind of misunderstanding — I’m being charitable — ignorance. They’re promoting it. RUSH: New York Times has already done this story. We told you about it January 8th: “Health Care and Profits, a Poor Mix.” It’s a very long story. The momentum is already underway. Democrats are worried, folks, that the cuts in sequestration will actually not be that bad. They’re worried about that.